Yet another fine amp from the Aguilar stable, a worthy successor and a pleasure to use. Simply splendid. Simple, intuitive with great tonal capabilities and enough power to please the most power-hungry bassist. With artists all over the world using Aguilar’s equipment, it must be hard for the guys and girls at the New York company to motivate themselves. The gear is adored, and its amplifiers appear everywhere, so how do you improve a winning formula? Simple - you go into the vaults, re-evaluate a previously successful product, shortlist how you could improve it and get to work. The AG500 head was a firm favourite of many players, so it was time to take it back into the proverbial shed and take stock. With Aguilar’s impressive track record, we were eager to take this baby for a spin. Care to grab a ride? The elegant Aguilar styling is clearly evident on the AG700. The clear, concise front panel design will certainly appeal to existing Aguilar users and may well attract new players to the fold. The black and white livery makes the controls and their functionality very obvious, and although there is a fully featured array of controls and options, the front panel is perfectly laid out. There isn’t much chance of getting confused by this amp. 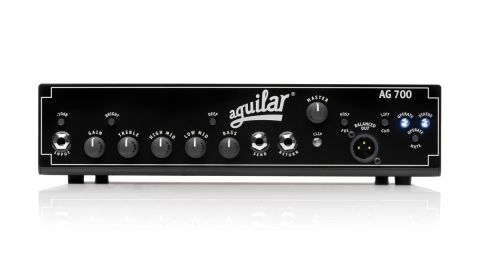 The controls are the same type as those used on the existing Aguilar product line, and having seen the production facility in New York, you can take it from us that this amp will have undergone rigorous testing before leaving the factory. The controls are all sturdily fitted and turn smoothly, and the selector switches are also slick in operation. The Gain and Master controls are accompanied by a four-control EQ section (bass, low mid, high mid, treble) and a pair of Bright and Deep switches for that extra kick in the pants should you need it. A quick glance at the Features list should indicate how flexible this amp is: the only thing missing is a headphone socket, which may or may not be a deal-breaker for you. As you’d expect, the AG700 offers a thunderous 700 watts at four ohms and an improved bottom-end operation, offering more lows with the power to pump those frequencies out without causing power issues and breakup of your signal. A pair of Speakon outputs allow you to connect up any combination of eight and four ohm cabinets, while the universal mains switching allows you to take this unit anywhere in the world without fear of blowing it up with an incorrect mains voltage. Aguilar’s tone, dynamic range and power handling are well respected and this amp maintains those standards, that’s for sure. We tested it with a passive Jazz and active four- and five-string instruments along with an Aguilar SL410x cabinet. The character of each bass shone through and even with a flat EQ, there was no lack of rumble, warmth and tight definition from each instrument. The passive Jazz benefited from the mid EQ on offer: as with other Aguilar amps, you don’t need to turn each control excessively to hear a fundamental change in your tone. In comparison, the active basses sounded great from the off but sounded even better when using the Bright and Deep switches: these are akin to giving both basses a turbocharge in the right areas. Slap lines sounded crisper and more powerful, while fingerstyle and pick lines had greater dynamic possibilities based on the attack of each note. The low B string on the five-string bass was handled very well: every nuance was conveyed, whether we adjusted the EQ on the bass or amp. Intuitiveness is definitely what this amp is about. With one cab attached, this is a powerful amp: adding additional cabinets will let it breathe in a more refined manner. That’s not to say it can’t sound aggressive. It certainly can: if you’re of the rock or metal persuasion, a two-cab setup with some extra mids dialled in will give you plenty of presence within the mix. Sitting somewhere between the Tone Hammer 500 and the DB751, the AG700 is most certainly worthy of the Aguilar name and carries on its traditions with aplomb. At a mere 2.22kg in weight, it’ll reward your back too. Aguilar took its time over releasing this amp, but it’s paid off: anyone purchasing an AG700 will be rewarded with a simple but effective amplifier that really does tick all the boxes. It’s effortless in its operation, portability and general setup, and for those who don’t require an over-featured amp with bright lights (it already has two of those! ), they may just have found their ideal unit. Try, listen and enjoy, readers!